The event, which was held on 23-25 January, was attended by more than 250 delegates, whose feedback suggested that the presentations were thought-provoking and gave new insights how the future might develop for the industry. One of the speakers at the Conference was leading world geneticist, Dr Alison Van Eenennaam of the University of California. Dr Van Eenennaam described how animal breeders have used a variety of methods in selective breeding programmes, to genetically improve food animal species. The concept includes the use of both genetic engineering and genome editing, although no animals produced using these methods have entered the food chain to date, she stressed. “Gene editing refers to a set of techniques whereby changes can be introduced into the DNA sequence that makes up an animal using molecular scissors,” she explained. “These tools are useful for targeting improvement in traits for which there is no within-species or within-breed genetic variation. “Templates have the potential to introduce existing genetic variation into one breed from another, such as introducing the polled allele from the Angus into the Holstein, or to introduce novel genetic variation in animals from different species. Her research had indicated that in order to become an important driver of genetic change, gene editing methods must seamlessly integrate with conventional animal breeding programmes, she stated. “It is likely that editing will be focused on large effect loci and known targets, while conventional selection will continue to make progress in selecting for all of the many small effect loci that impact complex traits. If permitted by regulatory governance and public opinion, genome editing could effectively complement, not replace, conventional meat animal breeding programmes,” said Dr Van Eenennaam. Meanwhile, Dr Stephen Conroy, manager of the Progeny Test Centre in Co Kildare, Ireland, reviewed the options for incorporating meat quality measures into beef breeding goals. He cited as an example the Irish Cattle Breeding Federation (ICBF), which was launched in 1998, as a non-profit organisation. It provides cattle breeding data to the Irish dairy and beef industries. Dr Conroy said the route to the production of the ICBF database had been a “tough road,” requiring farmers to perceive merit in the system. This had been achieved through the publication of genetic indices which help farmers to make profitable decisions. Researchers were currently looking into ways in which breed data could be used to select animals which produced meat with improved eating quality. “We are breaking down the carcases into 19 cuts, to monitor pH, marbling and colour,” said Dr Conroy. “Trained panellists then taste each cut and give it a rating, according to tenderness and flavour. “Some progress has been made on the heritability of eating quality traits, which have been identified as 25% heritability for tenderness and figures of 8% and 13% for juiciness and flavour respectively. Another speaker whose presentation was enjoyed by Conference delegates was Professor Mark Rutter, a specialist in applied animal behaviour at Harper Adams University. He outlined the various sensing technologies which had the potential to help dairy farmers to enhance efficiency and profitability. These were referred to as ‘Precision Livestock Farming,’ a system based on electronic identification. Despite all of the options available, Professor Rutter suggested that research was “lagging behind,” when it came to understanding cow behaviour. More information was also needed to examine feeding behaviour, he added. “Feeding sensors are available, but feed intakes are difficult to measure. Feeding time is not a good indicator, because cows will spend part of the time sorting through their ration. However it could give us data on whether the feed has been effectively mixed. 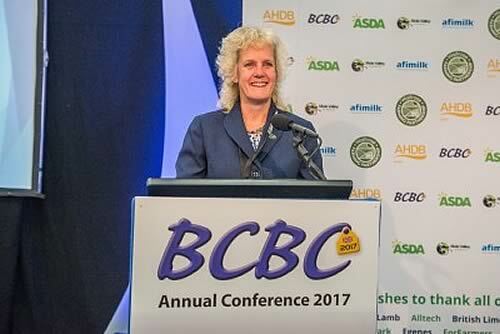 The BCBC wishes to thank the following sponsors for their support: Major sponsors: Asda; Afimilk; Waitrose Farming Partnership; AHDB Dairy; Mole Valley Farmers. Other sponsors: ABP UK; AHDB Beef and Lamb; Alltech; British Limousin Cattle Society; CIS; DairyPro; Dovecote Park; Egenes; ForFarmers; Hereford Cattle Society; Holstein UK; Merial Animal Health; MSD Animal Health; Neogen Europe; NMR; Shearwell Data Ltd; Shepherd Publishing; Shorthorn Cattle Society; SRUC; VikingGenetics; Zoetis.